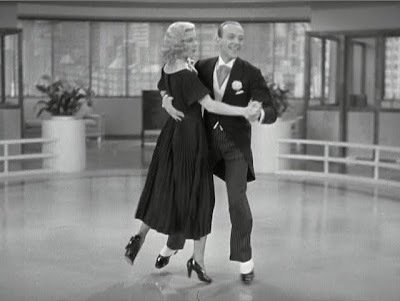 Fred Astaire and Ginger Rogers made ten movies together, and I'm ashamed to say I had never seen any of them until this diablogue, although I love many of the songs that came from them, written by Jerome Kern and other contemporaries. 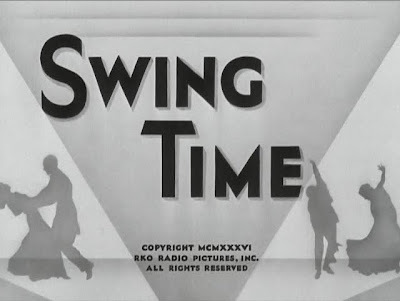 Swing Time is said to be their best collaboration, with the help of three Kern classics ("Pick Yourself Up," "A Fine Romance" and the Oscar-winning "The Way You Look Tonight") and a light storyline that allows room for several beautiful dances. 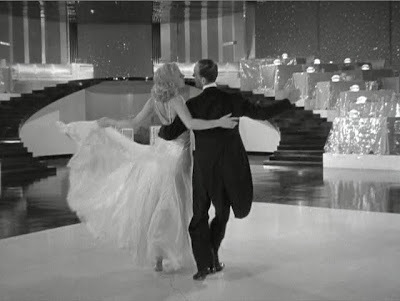 Astaire and Rogers, well ... there's just never been anyone like them before or since. Fun fact: Barack Obama quoted a line from "Pick Yourself Up" in his inaugural address. Nice throwback, O. SIDE NOTE: I realized while getting these photos together that if you don't want to read this whole entry but still want to get the basic jist of this film, just look at the pictures in this order and you'll pretty much get it. 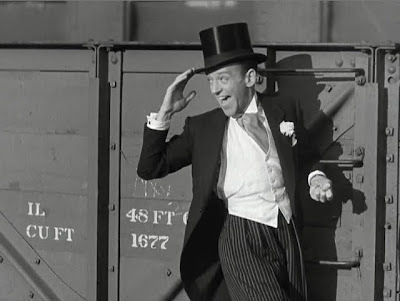 Fred Astaire stars as a more charming version of himself, a gambler/dancer named John "Lucky" Garnett, who, after being tricked by his dance buddies into being three hours late for his own wedding, must come up with $25,000 in order to appease his bride's father and show his good intentions. The scene where he's made late for his wedding by his conniving co-dancers is almos unwatchably bitchy, but I think an audience in 1936 would have known that this was meant to be slapstick, not cruelty, and that it would be a catalyst that lead to better things. And indeed it does -- he and a friend head to New York to find the money, and meet-cute of meet-cutes! 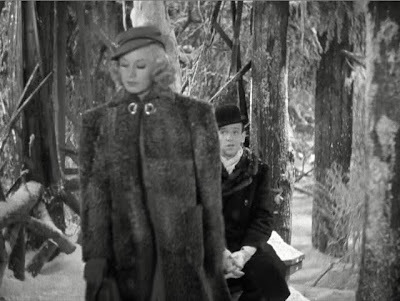 He ruffles the feathers of Penny Carrol (Ginger Rogers), whom he follows into the dance studio where she teaches. An adorable scene follows where he pretends not to know anything, and when she's fired for being unable to teach, he claims she's taught him an entire, perfectly synchronized routine. The moment he sweeps her off her feet and hop-steps her around in a circle, we are transported to Movie Heaven. Watching the two of them dance, you can hardly keep your heart inside your chest -- they just don't make dancers like this every day. Oh for God's sake, I just have to post the video. Talking about the two of them dancing is no substitute for watching the real thing. Sit back and watch. I love her face as she realizes he's been able to dance all along, and how he sweeps her up and she just goes along, as though she has no idea, and yet they're perfectly in sync. To a cynic, this would be ridiculous, and normally I would say "phooey" but how. can you?? Of course, the plot by definition has to have at least a little dramatic tension, and luckily it's in a beautiful snowy wood. Luckily it's soon over, and while you could feel like the story is just getting in the way of the dancing, you don't have to wait too long. Astaire and Rogers seem so modern in their acting styles that it's easy to forget this movie came before almost any classic of American cinematic acting. The "method" embodied in Vivien Leigh, Clark Gable, Katharine Hepburn, Marlon Brando and the like hadn't really been established yet, and here are two dancers who are such gentle clowns, not playing people really but playing kindred spirits in a movie that begs them to be together forever. Why even discuss the plot or the filmmaking or the acting or anything else, when the real reason this film belongs on the list is the match made in heaven of Astaire and Rogers? Their paired dancing is historical, of course, but really didn't they pave the way for every cinema romance ever after their ten-film streak? I think this film is probably the purest example of "meet cute" I've ever seen, and it proves that we love the movies best when they're fun, when Fred sweeps us off our feet and we start to dance with him. Bravo. I hate to get back to a world of sadness or darkness but #89 is M. Night Shyamalan's The Sixth Sense, and so onward I must trudge, under that creepy bed where some dead girl has a box for me. Maybe I'll keep this movie just a little longer, in case I need to pick myself up, dust myself off, start all over again.